Serve up a keen golfer with his drink of choice in this personalised mug. Personalise this Golf Ball mug with any name up to 12 characters printed onto the golf ball. The mug itself is printed and decorated with a high quality glossy finish! Unsuitable for safe use in microwave or dishwasher. Please note - we are unable to support special characters or accented letters, please refrain from entering these within your personalisation. The font used within this design may become unreadable if your required text is entered all in block capital letters. 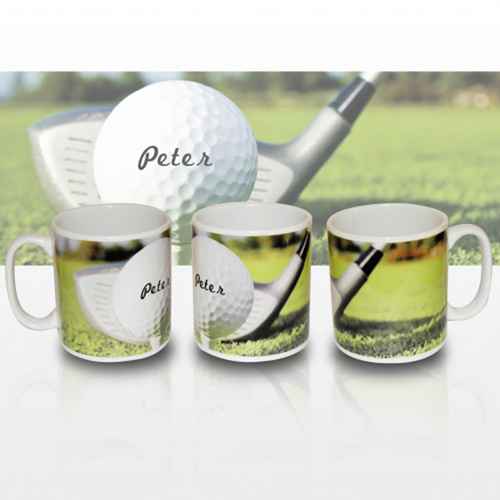 Personalise this Golf Ball mug with any name up to 12 characters printed onto the golf ball.